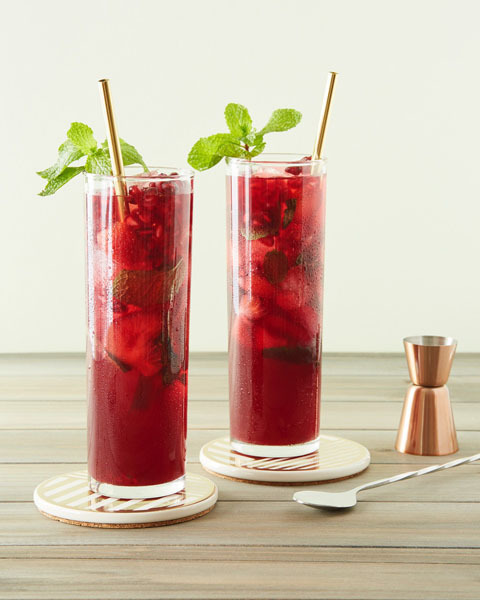 Summer is here and the heat is on so why not cool things off with these pomegranate inspired drinks that will make any party something special. The Moscow Mule gets its name from the ginger beer that “kicks you like a mule” with every sip. Our version gets an extra kick with a splash of POM juice. To make a mocktail, simply replace the vodka with extra ginger beer. • In a small pitcher stir together ginger beer, POM juice, lime, agave, orange bitters (to taste), and vodka. 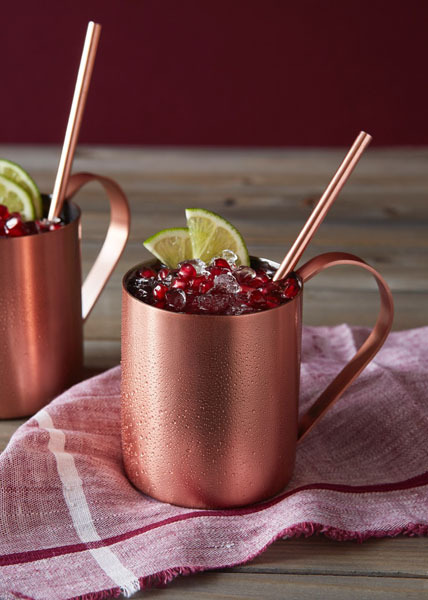 Divide mix between two Moscow Mule copper mugs and top with crushed ice to fill cup. Garnish with POM POMS and lime wedges. POM juice, rose water, gin, and tonic combine for a refreshing cocktail. Garnish with rose petals for a beautiful presentation. For a mocktail, simply leave out the gin and increase the POM juice and tonic water. • Stir to combine POM juice, tonic water, gin, and rose water in a small pitcher. Add ice to two glasses and top with drink mix. 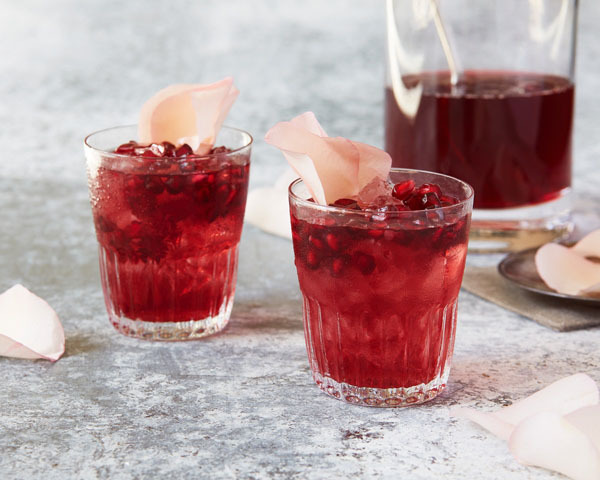 Garnish with rose petals and POM POMS. • Divide strawberries, mint, and sugar between the glasses and muddle together. Fill glasses half full of ice. • Add half the POM juice, lime juice and rum to each glass, then top off with seltzer and stir. Garnish with POM POMS, lime, and mint.